James Allan Guy, butcher, union official and parliamentarian for thirty years, was born at Launceston on 30 November 1890, to James Guy, blacksmith and politician, and Margaret, née McElwee, sister of G. J. McElwee, MLC. Father and son would have much in common. Both were active in the ALP, became Tasmanian MHAs and represented Tasmania in the Senate. The father played a controversial role in the Senate during the 1916 conscription crisis, but remained in the Labor Party. The son followed J. A. Lyons out of the Labor Party in 1931. After an education at Invermay Primary School, James Allan worked in Launceston as a butcher until 1916. He became active in union affairs, serving as secretary of the Launceston branches of the Federated Storemen and Packers’ Federation, the Baking Trade Employees’ Federation, the Federated Carters’ and Drivers’ Industrial Union and the Waterside Workers’ Federation. He was state secretary of the Australasian Meat Industries Employees’ Federation between 1911 and 1916, a member of the Butchers’ Wages Board and treasurer of the Launceston Trades and Labor Council. He also served as president of the Eight Hours Committee (1915–16, 1920–21). In 1920 Allan, as he was known, was appointed assistant to his father James, general secretary of the Tasmanian branch of the ALP. On his father’s death in 1921, Allan became general secretary, holding the position continuously until 1931. He was a delegate on the Federal Executive of the ALP (1922-30), and a delegate to interstate conferences from 1924 to 1927. Active in politics at local, state and Commonwealth levels, Guy was on the Launceston City Council between 1928 and 1931. In the Lyons Tasmanian Government (1923–28) he was Chief Secretary and Minister for Mines (1923–24), and Chief Secretary and Minister for Railways (1924–28). Guy had entered the Tasmanian Parliament in 1916 under the Labor Party’s colours, having stood unsuccessfully in 1914. Claiming to be the youngest minister in Tasmanian politics, he became Deputy Leader of the Tasmanian Labor Party in July 1925, after defeating Lyons’ rival A. G. Ogilvie. 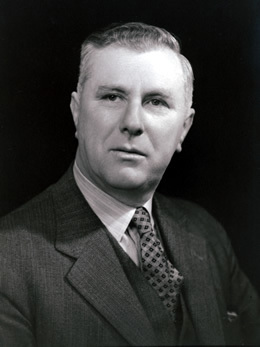 When Lyons was seriously injured in a car accident in July 1926, Guy became Deputy Premier and Treasurer, holding the position until the end of the year. In an effort to restore Tasmania’s public finances, the Lyons Government pursued a strict policy of economy, which Guy supported in a speech before the Commercial Travellers’ Association of Tasmania in August 1924. A caricature about this time depicts him as tall and lean; the caption below reassuringly observes that the Hon. J. A. Guy ‘conceals a kindly nature’ under a ‘determined expression’. He could, it seems, reel off ‘yards of figures with the utmost dexterity’, and had both a powerful voice and a strong personality. In the ALP push to unseat the Bruce–Page Government, federal Labor Leader, J. H. Scullin, recruited both Lyons and Guy, and at the federal election of October 1929 Guy was elected MHR for Bass and Lyons for Wilmot. As a consequence of disagreements between Lyons and the federal Labor Caucus, especially over the question of an overseas loan repayment, on 13 March 1931 Lyons, Guy and three other Labor MHRs voted for a motion of no confidence in the Scullin Government, and Lyons and his ‘little group’ left the Labor Party to later join the Nationalists in forming the United Australia Party, with Lyons as its leader and Prime Minister. The irony was not lost on Guy when the Scullin Government ultimately adopted policies ‘practically identical with those which were advocated months ago by the Leader of the Opposition, (Mr. Lyons), and a number of his supporters’; nor when Labor members went unpunished for criticising this policy. Guy spoke rarely in Parliament, doing his most significant work elsewhere, but when he did address the House of Representatives he often had something interesting to say. As a Labor MHR he expressed strong support for a formal conciliation and arbitration process. He sternly criticised the Leader of the Country Party, Earle Page, for the inadequacy of his knowledge of industrial matters, and attacked Nationalist opponents for seeking to protect proprietors who employed sweated labour. In constitutional matters, he supported the Scullin Government’s plan to alter the amendment process, asserting that those who saw the Constitution as something sacred and unalterable were ‘the greatest stumbling blocks to the progress of a nation one could have’. He claimed that a major problem for national advancement was section 51 of the Constitution, wherein Commonwealth powers were specified, and suggested adoption of the Canadian model, where the provincial powers were specified, leaving national powers ‘untrammelled’. With his change of party, Guy ceased to talk of such matters and kept largely to parochial Tasmanian issues such as potatoes, paper pulp, and the impact of trade upon the Tasmanian economy. What appeals to most of his friends is his directness and simplicity . . . unlike many politicians, he is not a sort of loudspeaker on legs or a human gramophone with two sides. Like his colleague, the Prime Minister, he is averse to those baby-kissing tactics to which some of our soft-soap politicians resort. But he doesn’t mind carrying the baby, metaphorically speaking, when it comes to hard work. Mr. Guy has indeed stepped up. And we can bet that in his new capacity he will step out. He was now responsible for explaining the Government’s tariff policy to Parliament, which he did quite ably, and for launching the new Sugar Agreement. Another responsibility related to film censorship. Without censorship, he said, ‘all sorts of puerile and undesirable films could be displayed, to the detriment, not only of our civilization, but of the Christian religion’. The public campaign, by the Friends of the Soviet Union, attacking the controversial banning of The Five Year Plan in 1932 was dismissed by Guy on the grounds that the film was not considered to be in the public interest. Guy’s loyalty to Lyons, however, had its costs. At the 1931 federal election, Guy faced opposition not only from Labor but from among the Nationalists, who were not convinced of his conservative credentials. In 1934 he faced two Labor opponents, one of whom, G. J. McElwee, was Guy’s maternal uncle. Much to the regret of the Mercury, the other Labor candidate, H. C. Barnard, narrowly defeated Guy. In 1937 Guy was defeated again, this time decisively. Lyons was thus deprived of his most loyal supporter, although Guy remained active within the party organisation. In 1938 Guy wrote to Lyons urging him to take advantage of ‘the urgent need to concentrate on National Security’ and to abandon the contentious national insurance scheme enacted earlier that year. He speculated about standing for the Senate. At a by-election in May 1939 he attempted to re-enter Parliament through the seat of Wilmot, now vacant following Lyons’ death. Guy was defeated in a poll seen as a test for the Government. Ironically, he won the seat in 1940 at a general election that left the UAP-Country Party coalition without a majority. He became joint Government Whip in June 1941 and, following the defeat of the coalition on the floor of the House of Representatives in October, continued on as Opposition Whip. He was a member of the Empire Parliamentary Association delegation that toured North America and Great Britain in 1943, and between 1943 and 1946 was a member of the Joint Standing Committee on Broadcasting. He was defeated at the federal election of September 1946, but three years later was successful in his bid for the Senate. Guy’s years in the Senate were taken at a much more leisurely pace. His few Senate utterances generally dealt with foreign relations, wherein he expressed views typical of the conservative side of politics in the postwar period. A major concern was what he saw as the communist threat to democracies such as Australia, claiming that Joseph Stalin’s ‘ultimate goal’ was the ‘control of the entire human race’. He asserted that the communists had plans to ‘conquer Asia before they put pressure on Europe’. He spoke of the need for Australia to be alert to the danger of the ‘southward march of the Communists’, and described the sending of Australian troops to Korea and Malaya as crucial. Guy pushed continually for a larger defence vote, and called for the introduction of compulsory military training. At home he was in favour of secret ballots in unions so as to weaken the power of ‘Communist bosses’. He continued to stand up for Tasmania, criticising the Government for failing to appoint any Tasmanians to the Cabinet. He was finally defeated at the federal election of 1955. He retired to private life, becoming well known to the members of the East Launceston Bowling Club. During his enforced absence from Parliament in the 1930s he was associated with the Twentieth Century Fox Film Corporation in Launceston, and represented the Motion Picture Distributors’ Association before the Commonwealth Film Censorship Board. In August 1940 he was appointed an inspector under the Commonwealth Conciliation and Arbitration Act. He was awarded a CBE in 1968. Guy married twice. On 7 June 1916 he wed Amy Louisa Adams, the daughter of George Adams and his wife Emma, née Austin, at Invermay, in accordance with the rites of the Methodist Church. In July 1951, as he was on his way from Launceston to a parliamentary sitting in Canberra, Amy died. On 12 July 1952 Guy married Madge Kernohan, the daughter of David Carson Kernohan, and his wife, Elizabeth Rutherford, née McGuire, of Marrickville, New South Wales, in the Presbyterian Church in the Sydney suburb of Punchbowl. There were no children. His final years were spent at his home in Sylvania Waters in Sydney. He died on 16 December 1979 at Fairmont Nursing Home, and was cremated at Woronora. Madge, and Guy’s son, Trevor, from his first marriage, survived him. Reviled by former Labor friends for his activity in bringing down the Scullin Government, Guy later chided those same friends for neglecting the true Australian way and for being prepared ‘to play the game on the Communist side’. World (Hob. ), 15 May 1920, p. 5, 6 July 1921, p. 6, 7 July 1921, p. 6, 19 July 1922, p. 5, 20 July 1922, p. 4; Australian Worker (Syd. ), 18 Apr. 1928, p. 9, 18 Dec. 1929, p. 7; Milford McArthur (ed. ), Prominent Tasmanians, Boyle & Co., Hobart, 1924, pp. 59-60; Richard Davis, Eighty Years’ Labor: The ALP in Tasmania, 1903-1983, Sassafras Books and University of Tasmania, Hobart, 1983, pp. 119-22. Examiner (Launc. ), 14 Dec. 1928, p. 7, 12 May 1931, p. 4, 23 Nov. 1914, p. 7; Mercury (Hob. ), 26 Oct. 1923, p. 7, 27 Oct. 1923, p. 10, 10 July 1925, p. 7; Davis, Eighty Years’ Labor, p. 22; Examiner (Launc. ), 10 July 1925, p. 5, 16 July 1926, p. 4; Mercury (Hob. ), 11 Aug. 1924, p. 9; Alex Gurney, Tasmanians Today, Davies Bros, Hobart, , p. 19; CPD, 25 Oct. 1950, p. 1310. Mercury (Hob. ), 17 Sept. 1929, p. 7; Philip R. Hart, J. A. Lyons: A Political Biography, PhD thesis, ANU, 1967, pp. 94–8; Letter, Guy to Hart, 3 May 1965, Papers Relating to J. A. Lyons, MS 9410, folder 3, NLA; Examiner (Launc. ), 23 Feb. 1931, p. 7, 24 Mar. 1931, p. 6; Mercury (Hob. ), 14 Mar. 1931, p. 9; CPD, 25 June 1931, pp. 3082–4. CPD, 9 & 10 Apr. 1930, pp. 1073–6, 26 June 1930, p. 3336, 15 Apr. 1931, p. 819, 23 Sept. 1931, p. 160, 7 Sept. 1932, pp. 278–82. Herald (Melb. ), 14 Oct. 1932, p. 6; SMH, 12 Oct. 1932, p. 11; Weekly Courier (Launc. ), 20 Oct. 1932, p. 5; CPD, 16 Mar. 1933, pp. 344–8, 4 Nov. 1932, pp. 1921–6, 27 Oct. 1932, p. 1673; SMH, 25 Jan. 1934, p. 8, 20 Feb. 1934, p. 8. Examiner (Launc. ), 5 Dec. 1931, p. 9; Mercury (Hob. ), 21 Sept. 1934, pp. 8, 9; Star (Melb. ), 25 Sept. 1934, p. 4; Letter, Lyons to Guy, 8 Oct. 1934, Guy Papers, MS 6405, NLA; Mercury (Hob. ), 13 Oct. 1937, p. 6; Letter, Guy to Lyons, 4 Nov. 1938, Lyons Papers, MS 4851, box 2, folder 12, NLA; Examiner (Launc. ), 25 Apr. 1939, p. 7, 3 May 1939, p. 4; SMH, 30 Oct. 1941, p. 8, 8 May 1943, p. 9; CPP, Joint Standing Committee on Broadcasting, reports on the broadcasting of news, 1944, 1946. CPD, 23 Sept. 1953, p. 208, 6 Dec. 1950, pp. 3750–3, 12 May 1955, pp. 351–3, 26 June 1951, pp. 368–71. Biographical Notes, Guy Papers, MS 6405, NLA; Examiner (Launc. ), 7 Aug. 1940, p. 4; 13 Dec. 1965, p. 6; SMH, 1 Jan. 1968, p. 5; Mercury (Hob. ), 3 July 1951, p. 2; CPD, 12 May 1955, p. 353. This biography was first published in The Biographical Dictionary of the Australian Senate, vol. 2, 1929-1962, Melbourne University Press, Carlton, Vic., 2004, pp. 221-224.